Video retail app YEAY have created a ranking analyzing how the world perceives and purchases tattoos in 2016. With tattoos becoming an increasingly mainstream style choice, the overall demand and availability of parlors is growing, and the way consumers buy tattoos is changing. After observing the trend of shoppers buying tattoo gift certificates for friends and family using their app, YEAY undertook extensive research to better understand this movement. The results present a comprehensive guide to current tattoo culture across the globe, with the Global Tattoo Index. The ranking is based on data taken from thousands of parlors around the world and the findings contain a twin focus. The first is the Accessibility Ranking, which ranks how convenient it is to buy tattoos in the city by taking into account the cost and the amount of parlors in each city. The second is the Purchasing Popularity Index, which studies how tattoos are bought and gifted. As part of the Tattoo Index, YEAY also ran a survey comprising of 5,000 participants on the general topic “tattoo.” The results reveal that while only a small minority of respondents (13.6%) have a tattoo, the majority (66.3%) consider tattoos to be mainstream. The findings also reveal the breakdown of the ways in which people with tattoos found their tattoo artist: through a recommendation (54.2%), visiting parlors (23.2%), online (13.6%), and other (8.9%). 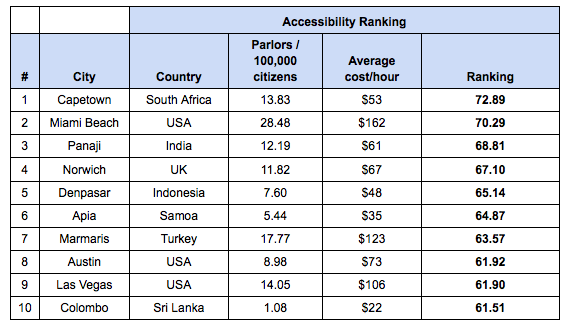 The results reveal that Toronto, Canada is ranked 31st for accessibility, with 2.14 parlours per 100,000 citizens and an hourly average cost of $67USD to be inked. This compares to the most affordable city Colombo at $22 per hour and the most expensive city San Francisco at $280. 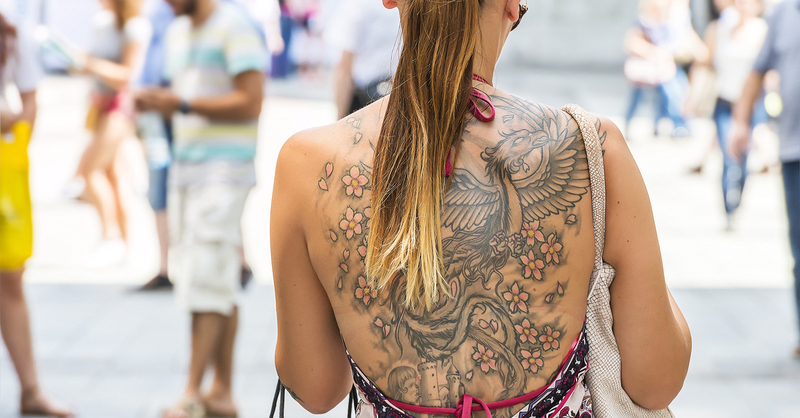 In Toronto, 30% of the tattoos are purchased by tourists, whilst 3% are purchased as gifts. Of those given as gifts, 10% are purchased by parents, 20% by other family, 30% by friends and 40% by partners.